This weekend I planned to grill Salmon using a Cedar Plank on the Big Green Egg. So, I looked around at the ingredients I had on hand and found some Red Miso that would be a great start for the marinade. After all was said and done, this Salmon dish turned out great and was easy to make! Now sit back, grab a glass of your favorite Chardonnay, and enjoy this recipe for Big Green Egg Cedar Plank Miso Salmon. I grabbed some vegetable oil, Rice Vinegar, Sesame Oil, Honey, Soy Sauce, Red Miso, Ginger, Garlic, White Sesame Seeds, and a 2 pound piece of Salmon. I mixed all the ingredients together (minus the sesame seeds and salmon) to form the marinade. I placed the Salmon (skin on) in a baking dish and covered it with the marinade. I placed this in the refrigerator for 2 hours to marinate. I preheated the BGE to 400° and when ready, I placed the Cedar Planks on the raised grid for 3 minutes and then flipped them in order to place the Salmon on. I put the marinated Salmon on the preheated Cedar Planks and let that cook while starting on the veggies. For the veggies I spiralized zucchini and squash them, then tossed with garlic, olive oil, and cooked them on my Mini Max over direct heat for 10 minutes or so. I let the Salmon cook for about 20 minutes or until it measured 130°. I pulled the Salmon and let it rest for 10 minutes before slicing and serving with Jasmine Rice and the Spiralized Veggies. 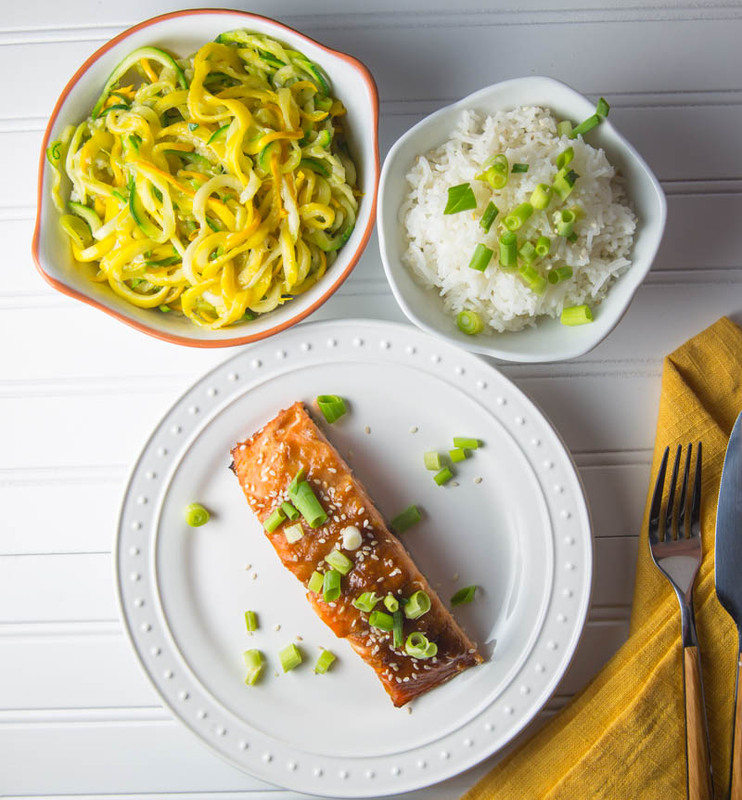 This recipe for Cedar Plank Miso Salmon is easy and packed with flavor.